Almaty (Agenzia Fides) - "When I think about the Kazakh Catholics, I am always amazed at the greatness of their faith. They do not have ancient traditions and Catholic roots, but I see a profound devotion to the Church, to the Pope, to the Eucharist, to the Rosary, to every aspect of our faith". This is what Mgr. 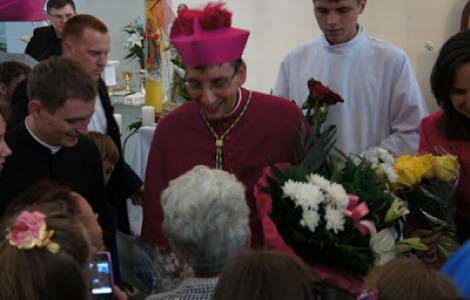 Josè Louis Mumbiela Serra, Bishop of the diocese of the Holy Trinity of Almaty says to Agenzia Fides. The Bishop reports: "There are faithful who walk many miles to take part in the Eucharistic celebration every day. There is great enthusiasm and it is also very good for us as pastors, because we do not feel alone". "In Kazakhstan - he continues - we Catholics represent a very low percentage, less than 1%. To cite an evangelical metaphor, I would say that the Kazakh Catholics are like a grain of salt: invisible in food, but able to change its flavor". And he adds: "I always tell our faithful that the wealth of Kazakhstan is not oil, it is not gas or energy: the progress of Kazakhstan depends on what this Christian community can be. We are few, but we must be aware of the importance of our presence". According to Mgr. Mumbiela, "this is the beauty of being small: we are few, we do not have great pastoral programs, we do what we can and what Providence grants us".